Ready to discover South America beyond-the-beaten-trail? Travel – once the preserve of the super wealthy, the gap yahs or adventurous 70s hippies – is now more available than ever. For less than £50 ($75) you can get half way across Europe. For a few hundred pounds, Asia – or even further. The possibilities for encountering new places, new cultures and new people have never been closer to home. Searching the web, you’ll find yourself inundated with articles professing to tell you about the top ‘must-see’ destinations in the whole world; the places that you just have to go to if you’re travelling; or the top 10 South American destinations that you need to fit into a three-week holiday. This is one way to travel. Fast, superficially and following the rest of pack. But I want to do something a little differently. I want to travel more profoundly and more consciously. And I want to inspire others to embark on their own adventures too. For me, travel is best when it’s slow and meaningful. That doesn’t mean to say you need to have six months, a whole year, or even more to travel. It just means that we need to slim down our itineraries and make the most of each destination that we visit. If we slow down, we have a better chance to discover those ‘must-see’ places, that ironically so few other travellers ever pause long enough to discover. Travelling adventurously fits well into slow travel. It doesn’t necessarily mean that you have to scale Everest, or swim with sharks. Whether you want to encounter the incredible landscapes of the Sacred Valley in Peru, travel ‘off-the-beaten-track’ to small towns along the Carretera Austral in Patagonia, or rarely-visited landscapes such as the Maragua Crater in Bolivia that, more often than not, don’t even gain a mention in your guidebook, travelling adventurously is just a different approach to travel. It’s about heading to a small town where no other tourists go or finding barely-known adventures a stone’s throw from the cities where everyone goes. It’s about stopping for more than a day to appreciate a new place, maybe even to learn a new language so that you can stop being a mute outsider and can start to learn more about the country from those who know it best. This approach to travel is one that will give you memorable – and often much more unique – experiences than merely following the hordes of other tourists. It will open up new ways of travelling, as it brings you into closer proximity with the local people and their lives. When you travel adventurously, you can peer beneath the manicured lawns of the tourist trail and see the raw, pumping veins of the life flowing beneath. And it isn’t just for the ‘adventurous’ souls. In fact, everyone can travel adventurously. How does this fit in with meaningful volunteering? For me, a carefully-selected volunteering placement takes me away from the tourist hot spots and plunges me into the heart of my new country. It’s about living in a remote community or learning how to communicate, whether by acquiring a new language or recognising that words are overrated. But what makes volunteering ‘meaningful’? Meaningful volunteering is about using your skills, expertise, or sheer enthusiasm to bring about useful, but most importantly, durable change in collaboration with the local community. A lot of volunteering placements don’t actively offer this, and it requires some researching (or using my guide) to be sure that what you’ll be doing will be of benefit. Ultimately, meaningful volunteering should be less about you, and more about the people who you have travelled to work with – listening to their needs and goals and helping them to find ways of achieving them. What do I know about going beyond-the-beaten-trail? My name’s Steph, and I’m a former English teacher turned travel journalist and guidebook author from the United Kingdom. When I gave up my career and moved to Bolivia in October 2014, I really had no idea what my purpose of travelling was; all I knew was that I wanted to use my skills as a teacher to support education organisations in South America, and maybe beyond. I had a volunteering position lined up with BiblioWorks in Sucre for six months, and then: the world was my oyster. Since that point, I’ve volunteered for three different organisations: BiblioWorks, Up Close Bolivia (both in Bolivia) and Latin American Foundation for the Future (LAFF) in Cusco, Peru. I’ve raised money to build a new library; I’ve helped to organise a reading fair for hundreds of young people and their families in Sucre, Bolivia; I’ve been interviewed in Spanish on live Bolivian TV; I’ve taught English lessons, led biology classes and delivered photography workshops (in Spanish), and overall, discovered how volunteering can be meaningful. I’ve learned how eye-opening it is working in collaboration with my Bolivian, and now Peruvian colleagues; the cultural differences, the red tape of bureaucracy which you find in whichever country you look; the excitement of being a part of something. 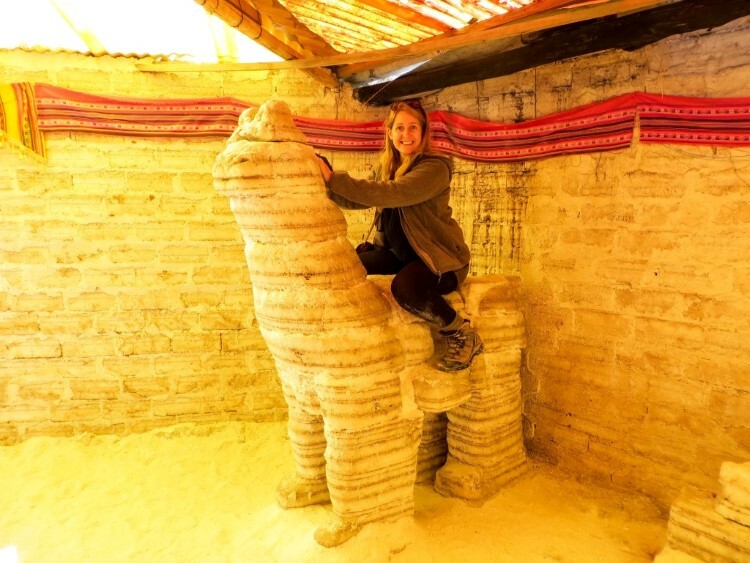 During this time, I’ve also had ample opportunity to explore Bolivia and Peru; to discover the waiting adventures at my fingertips and learn the hard way about what travelling can sometimes throw at you. I’ve wild camped in some of the most incredible destinations; I’ve trekked to cave paintings and dinosaur footprints, along stretches of Bolivian Inca trail and through Patagonia’s most famous national park; I’ve spent four days on a cargo boat travelling into the Amazon Rainforest and another four days sailing into the magical depths of the Patagonian fjords; and I’ve gone beyond the limits of where tourists normally travel to see a different side to Peru. Many of these adventures have come about thanks to my role as a guidebook author, working for UK-based Rough Guides and working for US publisher Avalon rewriting the brand new edition of Moon Chile, the latter of which is seeing me traverse the entire country. I’ve come to realise that adventure is a state of mind and a personal expression of what we can do – one woman’s adventure is another’s nightmare. I’ve also seen that volunteering is a recognition of your strengths and your weaknesses – and only by recognising what you can contribute (and what you need to learn – which is generally a lot) will mean that you have the greatest impact of all. So why follow Worldly Adventurer? With this blog I hope to inspire you to see the adventures that you can have – whether you have one week, eighteen days or a year at your disposal. By telling you about my adventures – and my many mishaps – I want to make adventuring in South America more realistic and reachable. I also want to demystify volunteering so that you recognise what you can do, and why choosing to spend a period of time volunteering rather than just travelling could be the best decision that you ever make. I hope to use my personal experiences to show you this new approach to travel, whether you want to adventure, volunteer or do both. I hope I can show you how adventurous travel and meaningful volunteering will alter the way that you discover South America. Join me on the journey to go beyond-the-beaten-trail in South America. Sign up for my monthly newsletter using the sign-up banner below, or let’s connect on Facebook, Twitter or Instagram. If you’re interested in working with Worldly Adventurer, please head to my Work With Me page or have a browse of the articles and short narrative pieces that I’ve written as part of my day job as a travel journalist on my Freelance Writing page.